Openherd: Hidden Hill Farm is a farm located in Antrim, New Hampshire owned by Carol Karsten. A Fleece Apart from the Rest. 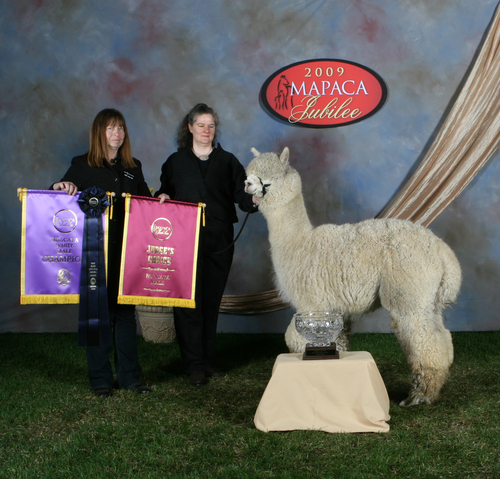 No hype, no drama -- Hidden Hill Farm Alpacas is just a true reference herd of top quality alpaca breeding stock. That has been my goal since I started out in 1997, and I have never wavered in my resolve to have a highly selected herd of purely top quality seed stock alpacas. 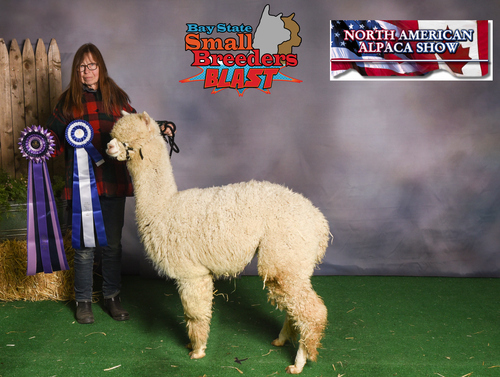 I can list off our 'champion bloodlines,' our amazing and mostly home-bred and born dam lines that knock the cover off the ball consistently and our home-grown champion alpacas, but I won't do it. Visitors can watch our animals grazing in the fields and I think they can see the quality -- I let the animals do the selling here! Oh, but if you ask me about an animal, I will tell you its pedigree, probably show you the dam and sire and maybe even a granddam or two! We welcome prospective new breeders as well as experienced breeders that are looking for that particular animal that they feel they need to take their program that extra mile. Packages? Sure, we will do them, but we much prefer that people select animals as the individual herd members that they really are. Ask us anything -- we believe in hands on evaluations of animals here. We do the same when we are adding breeding stock, which is something we are always doing to further herd improvement, and we want our buyers to be as satisfied as humanly possible when they select an animal at Hidden Hill Farm Alpacas. Do you want to learn more about fiber? Ask to visit our yurt and we'll take you through any number of our fleeces so that you can see what we do to evaluate and grade a fleece. I firmly believe that only you, the breeder or prospective breeder, ultimately can know precisely what it is you want to see when you look out your windows and gaze at your pastures. More importantly, there is only one time when you can select for more than one variable in the breeding business, and that is when you are selecting breeding stock! It is really important, then, to know what you want, isn't it? Visit as many farms as you possibly can, as you will learn something new at every farm you can manage to fit into your busy schedule -- I practically can guarantee that! 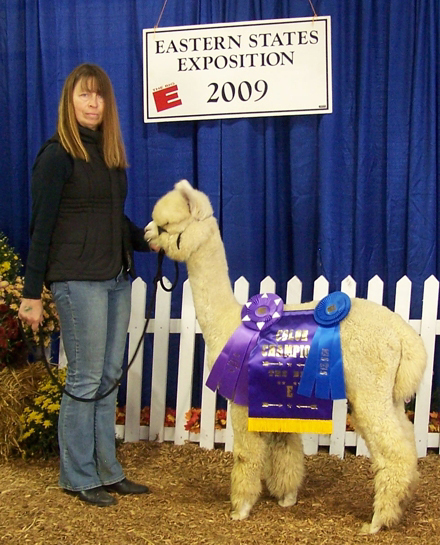 Like it or not, there is no breed standard in alpacas, thus each breeder must develop in his/her mind's eye, precisely what that "ideal alpaca" should be like, conformationally and in terms of fleece, and then realize that you won't ever find your ideal alpaca just as that perfect golf game will always elude you, but you will know when an animal approaches your ideal. If you cannot stand in a field of forty females and select three or four that you would like to examine more closely, you really are not ready to select alpacas. So, keep on visiting farms. Now, when people do buy from Hidden Hill Farm Alpacas, we strive to back up our animals with as much follow-up advice from our 20+ years in this business and the best guaranties we can possibly offer. We like to tailor financing to meet the needs of our clients, so we do not have set terms. Everyone has a different set of parameters, just as they do different goals, so a 'one size fits all' approach just makes no sense when talking financing terms. 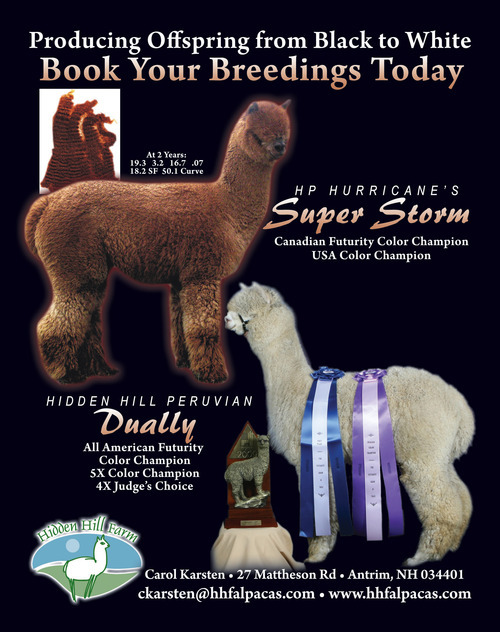 Not only have we our own home-bred and born AAA Futurity White Color Champion male, Hidden Hill Peruvian Dually, but we also now own HP Hurricane's Super Storm, the 2012 Canadian Futurity Brown Color Champion! We are running a fall special at $1000 a breeding for each of these spectacular males, both with color champion and judge's choice offspring on the ground in a wide array of colors. Only seven more breedings to Super Storm, and you need to lock with a 50% downpayment by 12/31/18, and only five breedings to Dually on the same terms. Use the breedings next year if you like but we intend to close both males to outside breedings after these are gone, making them available only to our and our customers' breeding programs in the future. Our proven female sale continues, but only six females remain available.